S-Line • Hundreds brave snowstorm for free rides on new line. Leah Hogsten | The Salt Lake Tribune Riders at the Fairmont S-Line stop. The new Sugar House Streetcar, or S-Line, held a free preview day for the public with free rides with a can of food, December 7, 2013. 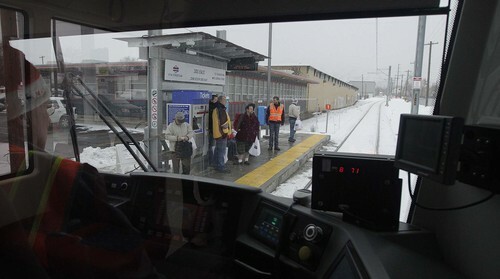 Leah Hogsten | The Salt Lake Tribune "The train would be especially nice in the summer," said Ella Crellin sharing a laugh with her husband Henry while riding the S-Line. The Crellins say the do a fair amount of shopping in Sugarhouse's business district and plan on using the train. The new Sugar House Streetcar, or S-Line, held a free preview day for the public with free rides with a can of food, December 7, 2013. 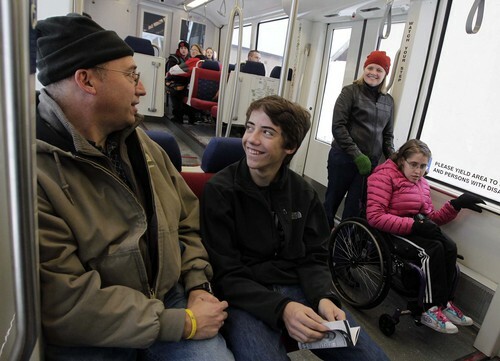 Leah Hogsten | The Salt Lake Tribune l-r David Petersen of Bountiful, son Everett, 16, wife Rosalie and daughter Ivy, 20, share a laugh while riding the train. 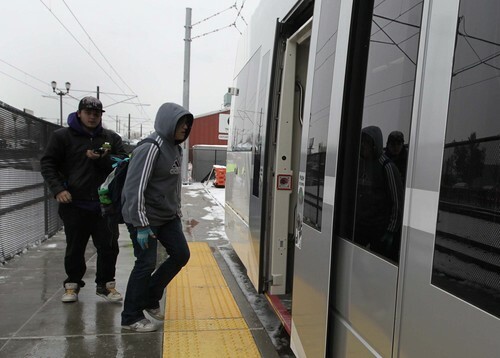 The new Sugar House Streetcar, or S-Line, held a free preview day for the public with free rides with a can of food, December 7, 2013. Leah Hogsten | The Salt Lake Tribune Riders await the train at the 300 East stop along the S-Line. The new Sugar House Streetcar, or S-Line, held a free preview day for the public with free rides with a can of food, December 7, 2013. 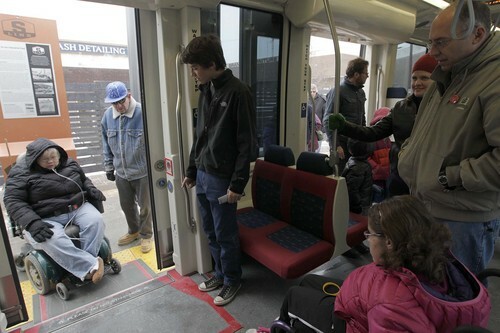 Leah Hogsten | The Salt Lake Tribune Everett Petersen, 16, (center) exits the S-Line at the Fairmont S-Line stop with his family. The new Sugar House Streetcar, or S-Line, held a free preview day for the public with free rides with a can of food, December 7, 2013. Leah Hogsten | The Salt Lake Tribune The new Sugar House Streetcar, or S-Line, held a free preview day for the public with free rides with a can of food, December 7, 2013. Karen Wheeler&apos;s family had a special reason to make sure they boarded the first Sugar House Streetcar carrying the public on Saturday. "My son Sasha was just 2 years old when the last train ran here," a freight train along a corridor that once ran as far as Park City. Sasha is 18 now. "We&apos;ve lived here for 19 years ... four houses away from the tracks, so we just had to be on the first streetcar." Her husband, David, added, "We&apos;re excited about what they are doing. Combined with the jogging trails they are adding, this should be beautiful." They were among hundreds of people braving a snowstorm and freezing weather Saturday to take advantage of a public preview day. Fares were free to anyone who brought a nonperishable food item to donate to the Utah Food Bank. The S-Line officially opens Sunday, running two miles from the TRAX Central Pointe station on 2100 South to Fairmont Park. It has stops about every two blocks. Normal fare is $2.50 for a one-way trip. 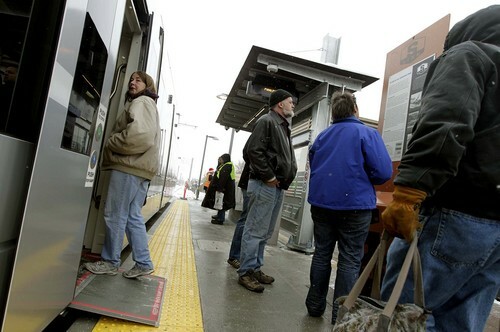 But as a promotion, fares are temporarily $1 for anyone who pays with electronic media such as a UTA Farepay card. 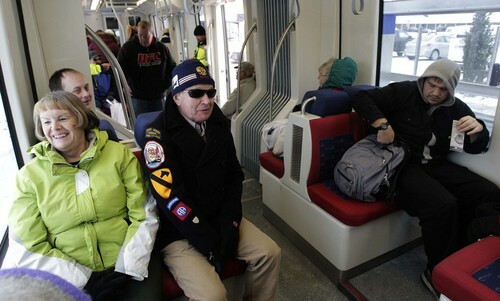 Among the first riders was UTA General Manager Michael Allegra. "I talked to one man who used to ride the streetcars in the area when he was child," Allegra said with a smile. Those old streetcars disappeared 50 years ago but are starting a return now. "People are excited to have streetcars back." Sugar House resident Alec Jenson sees the new line as a unifying feature. "This will give Sugar House a new vibe. It has been lacking something. This will unite us," Jenson said. "Rather than every­one jumping in their cars and driving by themselves, now we can ride the streetcar together." The unused rail corridor "is the perfect place for this," said Sugar House resident North McCormick. "I&apos;m excited to see what it will look like in summer with the new bike trails and greenspace." Most riders on Saturday seemed to live close to the line, although James Howard said he and his 2-year-old son, Austin, took two buses from Millcreek to ride. "My son was begging to ride the new train." Danny Nyman, who lives near the South Salt Lake portion of the line, brought his 2-year-old daughter, Elsie. "She calls the train Thomas," after the TV character. "We had to see it up close." He likes that the streetcar allows transfers to TRAX and the rest of the UTA bus and rail system throughout the Wasatch Front. "You literally can go anywhere in the world," especially considering it can transfer to TRAX that goes to the airport. Some riders were not sure if they like the different sort of transit experience the streetcar offers. "There are no parking lots by the stops. You have to walk to them. I don&apos;t know if I like that," said Pat Rowe, of Sugar House. Pat Sartor was among several riders who said it may actually be faster for them to ride existing buses on 2100 South because the streetcar travels only at an average 15 mph, which could actually slow their commute. She said she lives 1.5 miles east of the end of the streetcar line, so she would need to take a bus to the streetcar anyway. She said it and the bus do not run late enough to take transit for evening activities. Still, she said, "It is a nice train, and I&apos;m still excited about it." Sugar House resident John Nilsson also praised the new line. "I like this. It&apos;s a throwback to the way Salt Lake used to be" when streetcars were common, Nilsson said. "It&apos;s a more informal way to take transit."